Conflicting schedules prevented me from already seeing this at last year’s Viennale, despite the fact that it sounded quite interesting and promising. 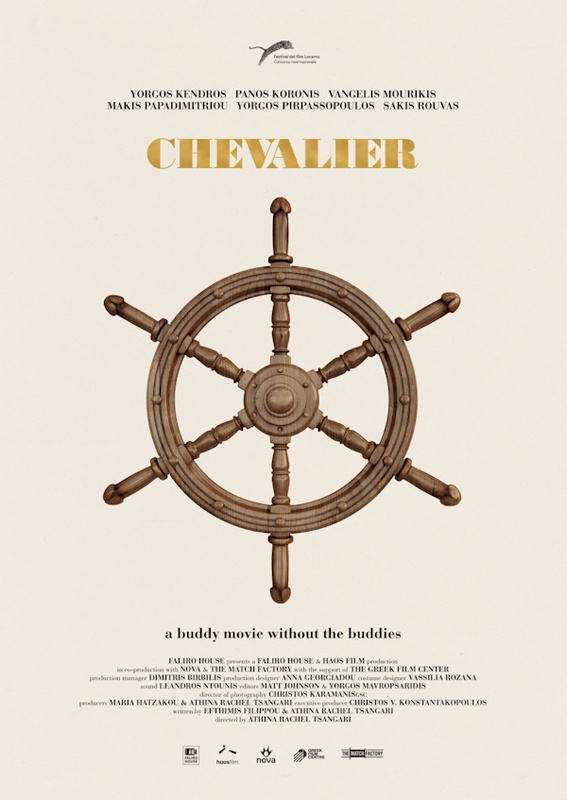 However, having now finally watched it yesterday, it turned out that I didn’t miss much, since despite an intriguing promise, “Chevalier” turned out to be rather boring and frustrating. Boring because nothing really happens, and frustrating because of all the potential that sadly – and downright criminally – goes to waste. I loved the basic idea of the movie. Six men who go on a diving trip together, and in the evening, decide to play some games to kill the time. One of them suggest a game called Chevalier that he’s played with a couple of friends before. They set challenges for each other, and whoever masters them best, wins a signet ring that he then wears until the next game. However, one of them suggests a tweak to the game: What if, besides the challenges, they’d actually evaluate each other in pretty much everything that they do? The way the talk, behave, walk, dress etc. What a killer idea for a movie! It’s a nice allegory of the feeling of some (all?) men that they have to constantly compete with each other in pretty much everything, and the pressure that goes along with that. There would have been so much potential for a slow, but steady, escalation of events, of a closer observation of men breaking under said pressure, and what this kind of scrutiny and competition does to someone. The movie, unfortunately, does none of that. Apart from a couple of nice, funny and/or memorable moments (“I’m not a pineapple. You take that back!” as well as the blood brotherhood will stick with me for quite a while), it panders along aimlessly, without any tension, and without ever really going anywhere. Maybe, after seeing movies where playing games escalates into quite bloody and extreme situations (“Cheap Thrills” comes to mind; even though I wasn’t particularly fond of that one either; but at least it wasn’t dull), I had the wrong expectations. However, I’m not saying that “Chevalier” necessarily needed blood and violence in order to be good – but it would have needed something. Some sort of escalation, some tension, a closer attention to what this competition does to them, raising stakes… anything, really. Because as it stands, it leads nowhere, and thus felt extremely pointless to me. I also found it hard, if not impossible, to follow the challenges, or the competition in itself. Not saying that I cared very much who was winning and losing, but even that would have been better than the succession of triviality and boredom that I ultimately got. It also didn’t help that we hardly get to know any of these characters, thus I didn’t really feel a connection to them. It probably didn’t help that I had a hard time remembering the names; thus, when they spoke about someone else, I often didn’t know who they were talking about. And even though I usually hate it when movies talk down to and/or spoonfeed their audience, in this case some sort of opening scene that introduces them, that tells us what they do, why they’re here, and how they are related to each other, might have helped. Because as it is, I couldn’t really relate to any of them, because I hardly knew them. There would have been so many interesting directions that you could have gone with this great idea for a movie. Unfortunately, Efthymis Filippou and Athina Rachel Tsangari went with an extremely subdued, serene approach that didn’t really work for me. Movies have the ability to present some sort of heightened reality, in order to drive their point home. With “Chevalier”, I’d have a hard time telling you what said point actually was supposed to be. Thus, in my opinion, the movie ultimately went belly-up – which, given its vast potential, is a crying shame. This entry was posted in cinema 2016, movie reviews, new releases and tagged 2016, Athina Rachel Tsangari, Chevalier, cinema, cinema 2016, comedy, Greece. Bookmark the permalink.